Starting a “stash” for cloth diapers isn’t cheap. No matter which route you go, you’ll spend over $100 easily. If you’re like me and money conscious, even $100 is a big deal. $300+ is a HUGE deal. So, obviously, you’d want to do all that you could to make sure your money goes a long way. If you take care of your cloth diapers, they will last you through potty training and possibly even through another baby/toddler! If you can get even 2 years of wear out of something that cost $300, you will save an average of about $1,300!!! That, my friends, is a deal in my book any day! And, I am just as much about saving money as I am about saving the environment! So, here’s my dos and don’ts for cloth diaper care to make sure you “get it right!” I quit the first time I tried to cloth diaper because of leakage. Thankfully, a friend had supplied the majority of my stash, so I didn’t waste loads of money. But, it was disappointing to say the least. I don’t want to see that happen to anyone. So, here goes…. Detergent types matter. They really, really do! I am extremely picky about which detergent I use for washing cloth diapers. But, as I have said before, I am also very thrifty (some may say cheap!). There are some GREAT cloth diaper detergents out there that are pretty pricey. There are also some that are a much better bargain. Keep in mind, though, even the pricey ones aren’t as bad as they may seem at first glance because you use about half of what you’d usually use in a load on each load of cloth. Anything that is high in soap content will leave a residue on your diapers, causing them to leak (you can use baking soda to cut down the buildup). Enzymes added for stain removal, while tempting, are also a no no as they can be a major irritant to sensitive baby bottoms. Perfumes/scents in detergents are, more often than not, made from Petroleum which has been shown to be toxic in animal testing. It is also not degradable, which means it will cling to your diapers. Fabric softeners are also a HUGE culprit of build up. Build up of anything on your diapers can lead to leakage. Leakage often leads to frustration and giving up on cloth diapers! If you want a softener, dryer balls are a great alternative. ECOs Free & Clear (This is what I use because it’s cheaper and it can be bought at brick and mortar stores. I have only found the others online. It is about $9/bottle. I have about 1/8 of my bottle left and I’ve been cloth diapering Isaac for 10 months now.). I hear of a lot of people using Tide with good results, but it has pretty much every no no in the book. So, I am not willing to try it and I would never recommend it if you want your diapers to last. A final option is to make your own detergent. When you get your brand spanking new diapers (or used ones too! ), you’ll need to prep them before using them. Different materials require different prep. Microfiber/fleece pockets are pretty easy prep. I just did one wash (hot-to get any factory yuckies off) with a small amount of detergent and then 2 rinses (cold). I threw them in the dryer because this “sets the PUL ” (PUL is polyurethane laminated fabric or, translation- makes them not leak). If you are using Bamboo or another natural material like Hemp, they will need more prep. Usually 1 COLD wash and 6 rinse cycles. Bamboo diaper sites often say not to dry them in the dryer, but I’ve heard many say they had leaks until they did low heat once to “set” them as well. Your best bet is probably to Google the type of diaper you have and how to prep them since it can vary. When it comes to washing cloth diapers, I think everyone finds their own way that works for them. Rinse – You want to rinse off the surface “stuff” and let that water drain so that you are not washing your diapers in dirty water (I have read to use a cold water rinse because hot will set the stain. I’ve done both cold and hot and don’t notice a difference). Wash – Then do a full wash to get them as clean as possible. Rinse – Then, you’ll do another rinse to get any detergent residue off. If my diapers were really dirty and I’ve used a little more detergent, I will double rinse them. Newborn breastfed poo doesn’t need to be rinsed off ahead of time. Just throw them in the washer as is. It is water soluble. Once they start solids, you need to rinse the diapers pre-wash. In my opinion, this is by far the worst part of cloth diapering! But, if you do it quickly right after you remove the diaper, it’s not awful. 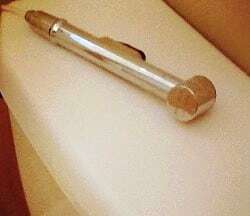 I was given a diaper sprayer that attaches directly to the water line running into the toilet. This is easier than scrubbing or even “swishing out” the poo, but it can still be a little messy. I just keep something by the toilet to wipe everything off after I am done (I use a spray bottle of vinegar and water) and I keep my pail right by the toilet. That way I can quickly toss the diaper in while it’s still dripping and it doesn’t get the floor wet or dirty. 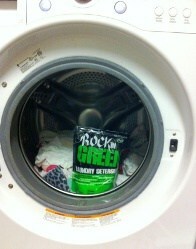 Once they are rinsed, you are good to go to toss them in the wash, as is. Whenever possible (weather permitting), I hang my diapers on the line to dry. This serves 3 purposes. It saves energy by not using a dryer, less wear on your diapers (heat damages over time) and the sun naturally removes stains! If I can’t line dry them, they go in the dryer on low heat. I do the covers for 30 minutes and then remove them and dry the inserts until dry (it varies on how long depending on how many inserts are in there). Pre folds will take longer as well. If you have only washed 2-3 covers, I would just hang them over the back of a chair as they will dry pretty quickly (With the exception of G diapers. For some reason, those REALLY hold the moisture and take a long time to dry). Keep in mind, the more you dry your diapers, the more you will “wear them down” and the less time they will last. Because most kids don’t potty train until about 2.5-3.5 years, you need to be careful with your cloth! There are 2 common methods for storing diapers prior to washing. Both involve a pail of some sort and a pail liner. The first is the “dry pail” method. I use a basic trash can. Mine has a lid which I only use if there is an especially stinky diaper in there (rinsing off the diaper does not remove 100% of the smell!). Some people use just the bag that can hang from a door knob. I don’t like to do that because it’s harder to get the diapers INTO the pail- especially when they are dripping from being rinsed! No thanks! You also don’t NEED the bag, but it makes it much less messy because you can just throw the bag into the wash with the diapers (take the diapers out first, though . ;)). The other method is a “wet pail”. This method includes using a pail of water to soak the diapers in prior to washing. Many people swear by it and say it helps to prevent staining. I’ve never done it because, well, I have 4 kids and it seems like more work! If you go this route, you’ll need to fill your pail with a half cup of baking soda and, if you like, a few drops of an essential oil like tea tree oil or lavender and then add water. If you go this route, be careful not to make the pail too heavy to lift! And, if you use a wet pail, make sure you have a pail with a LOCKING lid and keep it out of reach of your baby!!! If your diapers smell, it’s usually because you haven’t rinsed them well enough or you’ve waited too long to wash them. The easiest solution is to add some vinegar. I usually do about ¼ cup. Even if I don’t have a noticeable smell to the diapers, I do this about once a month to freshen my diapers. Another option is to add some essential oil to whatever detergent you use. Just a few drops go a long way. I have not tried this, but I have heard it is effective most of the time. If odors are strong, do a few extra rinses in the wash, add a vinegar rinse, and sun the diapers outside (fresh air will definitely help with smells!). Your final option, if all else fails, is “stripping” your diapers. That essentially means cleaning them with something stronger than the detergent you typically use (a tablespoon of liquid Dawn dish soap or even bleach if you’ve tried everything else) and HOT water. Run a regular wash cycle with hot water (it may even be a good idea to boil a pot of water and dump that in with your diapers to get the water even hotter). Then rinse, rinse, rinse in hot water until there are no more bubbles. It can take up to 15 rinse cycles to get all of the buildup out. I leave the lid open during the rinse to see if there are bubbles on top of the water. Any bubbles, I plan to rinse again. I’ve never had to rinse more than 6 times. Stripping is hard on your diapers, so don’t do it unless your diapers need it. Build up or hard water is what often leads to cloth diaper leaking. To solve the hard water issue, add a water softener to your wash loads about once a month. The buildup can be solved by stripping your diapers as discussed above. I usually find I have to strip mine about every 6-8 weeks. So far, I haven’t seen any noticeable wear on mine other than that the lining is piling a bit. That doesn’t seem to affect the use and effectiveness, so I am not overly concerned. If this doesn’t seem to help, you may have broken down the PUL with the wrong type of detergent, stripping too often or the diaper has simply run its course. When I tried cloth diapering with Micah years ago, I didn’t know as much as I do now and was washing the cloth diapers with cheap powdered detergent. It didn’t take too long before they were leaking and no amount of stripping seemed to help (and these were brand new hemp diapers!). I am now very careful who I buy used from and ask detailed questions about the washing/drying/care of the diapers prior to my purchase. Care is THAT important when trying to prevent leaks. 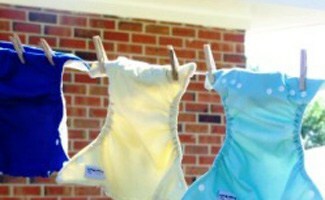 The easiest way to get rid of cloth diaper stains is to place them directly in the sun for several hours. I had one badly stained diaper that I sunned for 2 days for about 4 hours each day and the stains came out completely. Try spraying on a little lemon juice before putting them in the sun to increase the sun bleaching! If that fails, you can try a little peroxide directly on the stain and then re-wash the diaper. Be careful not to use too much as peroxide can yellow the diaper. So, there’s your basic intro to washing cloth diapers. The benefits are MANY and they are super cute! So, why not give it a shot??? Your Earth will thank you (and your pocketbook will too!)!!! What are your secrets and stories? Share them below in our comments so that other readers can benefit from your experiences as well. Mother of four boys and the wife of a minister in Georgia. The world is full of medical “miracles” but over time and lots of experience, this mom has discovered that raising a natural baby creates the most wonderful bonds and lessons for her children.